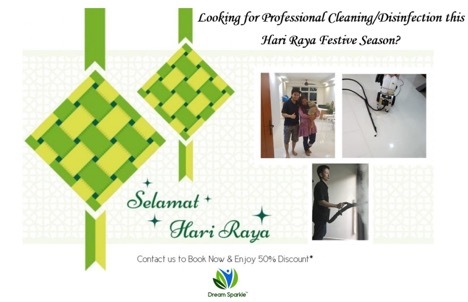 Dream Sparkle Year End / CNY Spring Deep Steam Disinfection Cleaning Promotion - Dream Sparkle Pte. Ltd. Stand to WIN 💵$888💵CASH* today if you sign up for Dream Sparkle Year End / CNY Spring Deep Steam Disinfection Cleaning Promo! ➤Are you moving in and need your New Home a post renovation steam cleaning disinfection? ➤Are you moving in to a Resale Home and want to ensure your family the cleanest and healthiest environment possible? ➤Are you preparing for Year end & Chinese New Year Spring Disinfection Cleaning? ➤We offer the most thorough and effective steam cleaning services in the area! Our $0.50 per Square Feet Signature Steam Cleaning includes everything you need to have your Home looking, feeling and smelling at their very best! Sign up for our Year End / CNY Spring Deep Steam Disinfection Cleaning Promotion and stand a chance to win $888 cash! Promotion period from Nov 2018 till end of Mar 2019. 1 lucky winner will be chosen by Dream Sparkle’s management at end of Mar 2019. Promotion only applicable to all customers who sign up for YECNY2018 cleaning or disinfecting (residential or commercial offices applicable with minimum spending of $588 or above.) and follow T&C no. 2.